Single gene disorders disrupting surfactant metabolism and resulting in acute and chronic lung disease have been identified in recent years. This review focuses on lung disease resulting from mutations in the genes encoding surfactant protein B (SP-B) and member A3 of the ATP-binding cassette (ABCA3) family of membrane transporters. 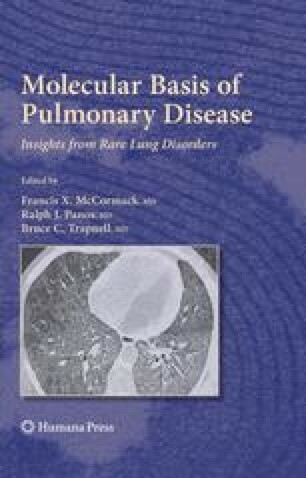 The roles of these proteins in surfactant metabolism is reviewed, along with the epidemiology, molecular genetics, clinical features, natural history, lung pathology findings, approach to diagnosis, and treatment of the disorders resulting from mutations in these genes. Irreversible neonatal hypoxemic respiratory failure due to diffuse parenchymal lung disease is a common presentation of both disorders. Children with ABCA3 mutations may also present with relatively milder disease and findings of interstitial lung disease. While rare, these disorders result in significant respiratory morbidity and mortality, have provided insights into normal surfactant metabolism, and implicate these genes as having a role in more common lung diseases.